If you’re looking for a scuffed but solid L-shaped full-sized wooden desk, look no further than the Whitehorse dump’s free store. I can't think of all that much else to write. The title is pretty self-explanatory. We dropped it off this afternoon and protected it from the elements as best we could. All the drawers, legs, and fasteners are included. 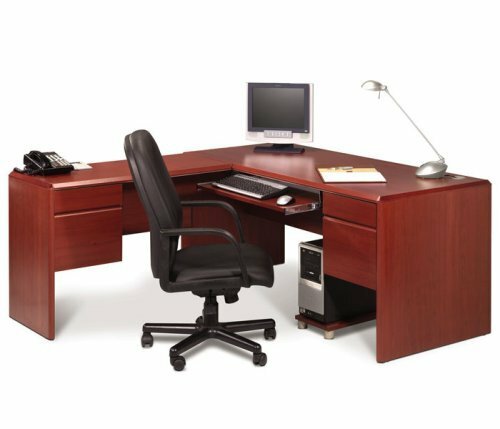 Artist's conception of free desk left leaning against the free store shed. Not exactly as shown. The desk looks something like the photograph to the right, but is a bit darker and made with thigh-bruising sharp corners. I hope someone can give it a home before the next rain shower de-laminates the edge trim even further. The top surfaces are in very good shape. It's built like a tank, so bring a friend and a truck to cart it away. I bought it from a used furniture store in Kingston about 20 years ago and it has served me faithfully for all that time. I guess I could think of more to write after all. Sniff. Goodbye ol' Desky McDeskerton. Sniff, sniff.